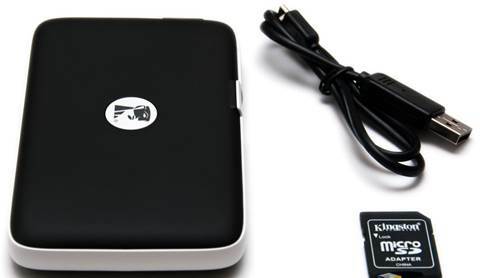 The Kingston Mobile Lite Wireless G2 is described as a ‘wireless media reader’—it says so right on the box, but that’s selling it short. 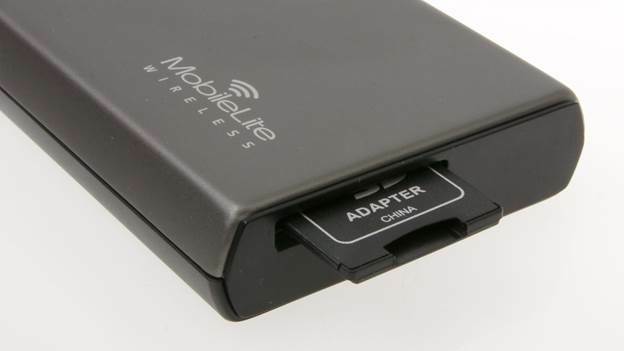 It’s actually a ‘wireless media reader that is also a portable Wi-Fi/LAN/3G router and a backup battery charger all-in-one’, but I guess that won’t fi t. As its name implies, this is the second generation Mobile Lite device from Kingston. The major improvements to the G2 include a much larger battery - 4,640mAh on the G2 compared to just 1,810mAh on the original—plus LAN and 3G connectivity options in addition to Wi-Fi. The G2 offers one major feature the G1 doesn’t: It can act as a travel router. If you’re at a hotel, for example, you can plug the available Ethernet cable into the device, at which point it will begin serving Internet access to anyone connecting to it. Outwardly, the G2 has four ports: an Ethernet port at the rear, a full-sized USB port and SD card slot to the left and one micro USB port in front. The front micro USB port is basically used to recharge the G2. However, in addition to being charged, it will also turn the G2 into a standard wired card reader when connected to a PC. The G2 will read any USB drive or SD/SDHC/ SDXC that’s plugged into the side ports and supports FAT, FAT32, NTFS and exFAT formatted drives. To use it as a backup battery, you connect your smartphone to the side USB port and turn the G2 on. Just remember that the G2 has two operating modes. Pressing the power button once initiates a battery test mode. Pressing and holding the power button for longer than 3 seconds will turn the G2 on fully. If you just want to charge your phone, you should do it in the battery test mode, since this will not enable its Wi-Fi features that drain its battery faster. At the front of the MLWG2 are three status LEDs (charging, Wi-Fi, power-on), the power button, the microUSB port, and its branding (which is actually quite attractive). Kingston’s Redhead logo is found front and center on the top (albeit in a more suitable white color). Connection with the Mobile Lite G2 must first be established via Wi-Fi. This means disconnecting from mobile data or other Wi-Fi networks that your smartphone, tablet, or PC/notebook is currently connected to. If your main goal is merely to access data or stream movies from the G2, this shouldn’t pose an issue. If you don’t want to lose your internet connectivity, the G2 allows you to have your cake and eat it too. As a mobile router, the G2 has three ways to connect to the internet. You can connect directly it via its Ethernet port, as a bridge to an existing Wi-Fi network, or by using a USB 3G dongle. However, if you chose to last option, it will occupy the USB port and you’ll be left with only the SD card slot for data. To interact with the G2, you have to download the Mobile Lite app. It supports Android 4.0+, iOS 7 and above, plus Kindle Fire and Fire HD devices, so the app is available on Google Play, Apple and Amazon App Stores. The app acts as a fi le manager to read and copy fi les between your smartphone and the G2, plus the control panel to configure its wireless settings, view battery status or reboot the device. By default, the Mobile Lite app will recognize some popular formats such as mp3, mp4, wav and jpg, and sort them by photos, videos and music. However, the G2 is not a media streamer; it has no native fi le playback features. It will allow you to access just about any fi le on connected USB drives or SD cards, but to open, view or playback these fi les, you’ll need an appropriate app on your smartphone or tablet such as VLC. At one of the ends is where the USB and memory storage plugs in. Being that the SD card I plugged in is pure black, it’s nearly impossible to see in this shot, but the same can’t be said about Kingston’s bright DataTraveler Mini 3.0 drive. Although the G2 is designed as a mobile companion, you can actually access its contents wirelessly from a notebook just the same. However, since there doesn’t seem to be a Windows or OS X app, you can only access its fi les and settings via web interface. The problem here is that you have to manually find its current IP address and input that in your browser, which isn’t that straightforward. In use, the G2 performed as advertised. Wired connection and charging features are pretty much standard. The Wi-Fi connection it created was rock solid for streaming even full HD movies, though there was a drop in wireless speeds when using Wi-Fi bridge mode to access the internet. The app could use some polish in the UI department, but it is speedy and establishes a connection very fast. The Kingston Mobile Lite Wireless G2 is actually one of the few well-thought out devices that I can see being of real use, especially during travels. My only real complaint is the lack of proper documentation that details exactly what it is capable of. There isn’t even a quick start guide in the packaging.